From the Department of Neurology, University of Ulm and Universitäts and Rehabilitationskliniken Ulm, Germany. NMDA receptor encephalitis (NMDAR-E) can be associated with severe dyskinesias and life-threatening dysautonomia,1 with the need for an intensive care setting. After NMDAR-E, severe long-term disability is infrequent2; however, its exact basis remains ill-defined. A 23-year-old Caucasian woman presented with a 10-day history of nonverbal acoustic hallucinations and insomnia. Neurologic examination only showed psychomotor slowing. Cerebral MRI was normal (figure, A, first column). CSF showed 73 leukocytes/μL, isolated oligoclonal bands, and slightly increased lactate (2.3 mmol/L, normal <2.1 mmol/L). NMDAR antibodies in serum and CSF were positive (1:100), and other antineural/onconeural antibodies were negative. No ovarian teratoma was detected. Although 1,000 mg methylprednisolone and immunoglobulins 0.4 g/kg were administered IV for 5 days, followed by oral prednisolone 1 mg/kg and tapering (20 mg every second day), her condition worsened. Dyskinesias, dysautonomia, and respiratory insufficiency required analgosedation and artificial ventilation. Multidrug analgosedation (propofol, midazolam, esketamine, sufentanil, alpha-2 receptor agonists, and 4-hydroxybutyrate) failed to alleviate dyskinesias and dysautonomia (>160 bpm, systolic blood pressure 200 mm Hg) but led to laboratory signs of drug-induced hepatotoxicity (transaminases 36-fold of normal). However, all these subsided after switching to isoflurane. Rituximab (1,000 mg IV, 2 doses 2 weeks apart) was administered followed by immunoadsorption. As dyskinesias reappeared on isoflurane reduction, high concentrations (1.2 end-tidal volume%) were maintained for 72 days. MRI now showed symmetrical striatal and dentate nuclei T2-weighted hyperintensities (figure A, second column, arrows) and mesiotemporal atrophy. Otherwise unchanged CSF now showed prominently increased lactate (4.2 mmol/L). CSF neurofilament light chain levels, a neuronal damage marker,3 were dramatically increased (15.796 pg/mL) compared with CSF obtained 4 weeks (798 pg/mL) and 16 weeks (174 pg/mL) earlier. Suspecting an adverse reaction to isoflurane,4 IV analgosedation was reinstated. Arterial hypertension soon reappeared. Upon follow-up MRI, striatal and dentate nucleus hyperintensities had dissolved. However, now features typical for posterior reversible encephalopathy syndrome had appeared (figure, A, third column, arrows) and made switching to isoflurane inevitable. At 5 months, the patient became alert and adequately oriented but suffered from severe flaccid tetraparesis and hypoesthesias, clinically and electrophysiologically consistent with critical illness polyneuropathy/myopathy (CIP/CIM). 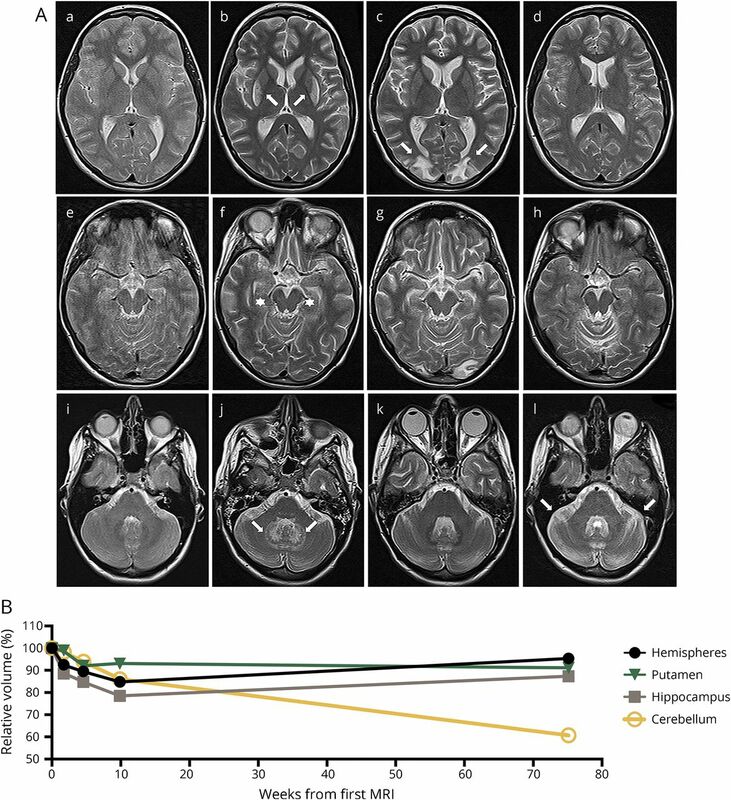 While only minimal cognitive impairment was noted at 9 months, she was still seriously handicapped, now rather by cerebellar ataxia than residual CIP/CIM. MRI showed reversible forebrain atrophy hardly affecting the putamen and progressive cerebellar atrophy (figure, A, forth column) that was confirmed by MRI volumetry (figure, B). At 36 months, cerebellar ataxia showed mild improvement but still persisted in everyday relevance. (A) Transaxial T2w MRIs at levels depicting the basal ganglia (A.a–A.d), the mesiotemporal structures (A.e–A.h), and the cerebellum (A.i–A.l) are shown. MRI at initial presentation showed no abnormalities (A.a, A.e, and A.i). After 72 days of isoflurane, T2w signal hyperintensities in the lateral striatum and the deep cerebellar nuclei developed (A.b and A.j, arrows). Temporomesial atrophy became evident (A.f, stars). Remission of the T2w signal hyperintensities after discontinuation of isoflurane while after therapy-refractory arterial hypertension, PRES with typical vasogenic edema developed in bilateral occipital regions areas (A.c, arrows). Mesiotemporal atrophy proceeded. Nine months after disease onset, signal abnormalities associated with PRES were in full remission while severe cerebellar atrophy had occurred (A.l, arrows). (B) MRI volumetry performed using the FMRIB Software Library (FSL, Version 5.0.9, fmrib.ox.ac.uk/fsl, for details see ref. 13) demonstrates a mesiotemporally pronounced reversible atrophy hardly affecting the putamen and progressive cerebellar atrophy. Volumes of the different structures were normalized to the volume of the initial MRI. NMDAR-E = NMDA receptor encephalitis; PRES = posterior reversible encephalopathy syndrome; T2w = T2-weighted. Poor outcome with severe disability or death after NMDAR-E is rare,2 and the pathophysiologic basis for persistent neurologic impairment remains largely unknown. Nevertheless, there are some risk factors that are represented by our case, including life-threatening dysautonomia resulting in severe blood pressure fluctuations with organ damage and orofacial dyskinesias compromising artificial ventilation1,5 with the need for multidrug analgosedation leading to hepatotoxicity. The switch to a volatile anesthetic was a reasonable consequence; however, long-term isoflurane can be associated with a reversible mitochondrial toxicity,6 apparent by imaging hallmarks, as well as putative CSF markers for mitochondrial dysfunction and neuronal damage, so a balanced analgosedation can be a challenge in NMDAR-E. In long term, our patient developed functional disability in cognitive impairment with partial remission, a severe neuropathy attributed to CIP/CIM after repeated sepsis, and persistent cerebellar atrophy, all of them representing additional risk factors for poor outcome. Reversible cerebellar ataxia is rare in adult NMDAR-E (<3%)2 and is progressive in only a few patients.6 As septic encephalopathy spares the cerebellum, cerebellar atrophy omitted the cerebellar nuclei previously involved in isoflurane-associated MRI changes in our case and the 2 patients with ataxia reported in the literature did not receive isoflurane,6 we hypothesize an alternative yet unknown pathophysiology. In summary, multiple complications after NMDAR-E represent a rarity, some of which indeed may lead to long-term impairment, e.g., cognitive decline, CIP/CIM, and cerebellar atrophy. Further research is warranted to elucidate the diverse pathophysiologies of chronic severe functional impairment after NMDAR-E.
S. Jesse contributed to the design and conceptualization of the case report, to the analysis and interpretation of the clinical data, and to the drafting of the manuscript. R. Gastl contributed to drafting and revising of the manuscript for intellectual content. J. Wagner performed the voxel-based morphometry and contributed to drafting and revising of the manuscript for intellectual content. P. Steinacker contributed to drafting and revising of the manuscript for intellectual content and measurement of neurofilament light chain. M. Otto contributed to drafting and revising of the manuscript for intellectual content. J. Kassubek contributed to drafting and revising of the manuscript for intellectual content. J. Lewerenz contributed to the design and conceptualization of the case report, to the analysis and interpretation of the clinical data, and to the drafting of the manuscript. S. Jesse, J. Wagner, R. Gastl, and P. Steinacker report no disclosures. M. Otto served on the scientific advisory board for Neuroallianz, Axon, Biogen; received speaker honoraria from Axon, Lilly, Virion, Fujirebio; holds a patent for diagnosis of Parkinson disease dementia; consulted for German competence net diabetes; and received research support from Deutsche Forschungsgemeinschaft, Bundesministerium fur Bildung und Forschung, European Commission, Thierry-Latran Foundation, ALS Foundation. J. Kassubek served on the scientific advisory board for UCB Pharma, BIAL, NeuroDerm, Teva; received speaker honoraria from UCB Pharma, Teva, Novartis, Zambon, Medtronic, Destin, AbbVie, Boehringer Ingelheim, GlaxoSmithKline, Merz; and served as section editor of Frontiers in Neurology. J. Lewerenz received speaker honoraria from Euroimmun, Teva, Movement Disorders Society and travel funding from CHDI; and oversees a laboratory of a nonprofit hospital that offers testing for antineuronal and onconeuronal antibodies. Full disclosure form information provided by the authors is available with the full text of this article at Neurology.org/NN. The authors thank Kerstin Löhr, Armin Bartl, and Hayrettin Tumani for help in the complex clinical diagnostics and treatment of the patient. Accepted in final form September 14, 2018.
. Prolonged high-dose isoflurane for refractory status epilepticus: is it safe? Anesth Analg 2010;111:1520–1524.
. Administration of isoflurane-controlled dyskinetic movements caused by anti-NMDAR encephalitis. Neurology 2013;80:1997–1998.